With great sadness, we’ve put Kepler up for re-adoption so that he can have a fresh start. We haven’t reached the decision lightly – I’ve been putting it off for months – but the fact is that we hardly ever see him. He spends all day, from when we first let him out in the morning until dusk, at the neighbours’ house, playing with their Maremmano who is at least twice his size and weight, or sleeping on their sofa. Maybe this wouldn’t have arisen if we’d had a fence round the house (not a feasible proposition) and he’d never met his girlfriend the Maremmano, or if the neighbours had sent him back at the beginning like I asked – their behaviour in all this has been far from exemplary. We’re here all day and so are our other dogs who boffle around nearby and never go as far as the neighbours. It’s not like he’s short of company at home, and he seems to confuse if not actually upset the other dogs. We therefore don’t have Kepler’s company in return for feeding him and giving him a warm place to sleep, and there’s also the fear of our resentment if he should incur a big vet’s bill. He’s our dog in name alone. 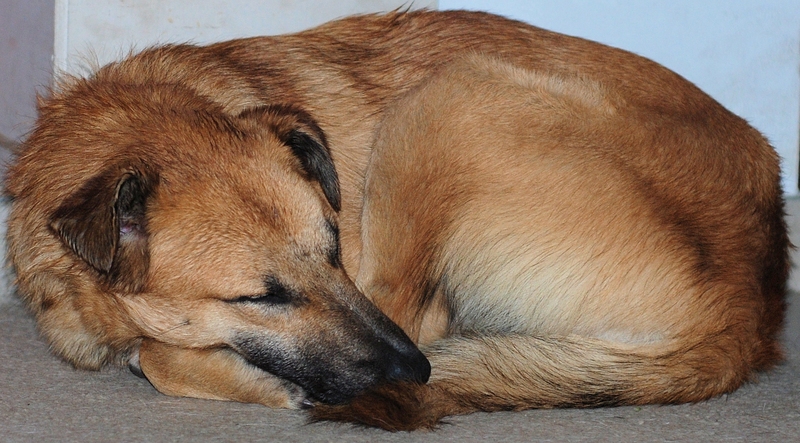 When he does finally come home, this is what he looks like for most of the evening – dead tired and withdrawn. It will soon be time for the olive harvest. 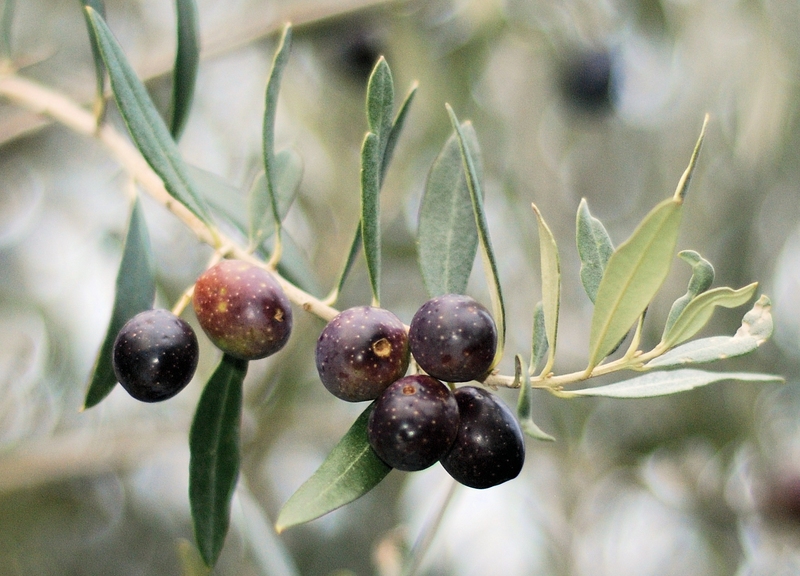 Olive trees produce a good crop generally every other year, like some fruit trees. This is the year the crop should be good and there were a lot of flowers on the trees, but unfortunately the rain hit exactly wrong and the flowers weren’t fertilised. There are a few olives here and there, on some branches and some sides of the trees, although whether there’ll be enough for our neighbour even to bother I’m not sure. The only thing he’s done in the grove all year is mow the grass once, so he won’t have lost out much. I’m amazed at his knowledge about the trees. There are different varieties, all with their different characteristics, and he identifies them from a distance and rattles off their names so fast that I can’t remember them. 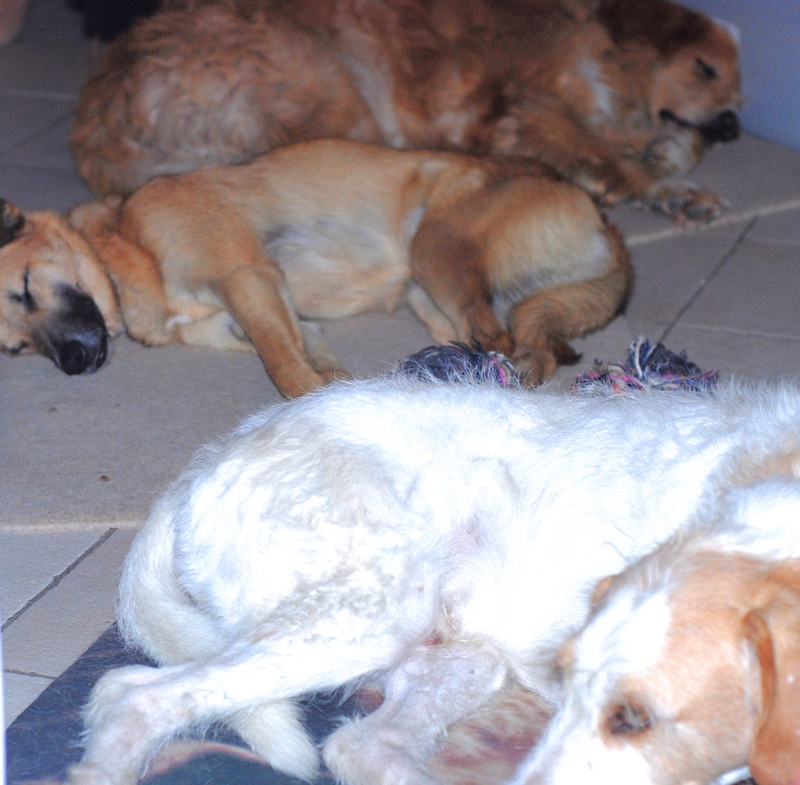 This was the peaceful scene – or wall-to-wall doggy dormitory as I call it – when we were watching the football on tv this afternoon. The dogs don’t appreciate the clocks going back, though. They might look dozy here, but they certainly aren’t when their stomachs tell them it’s time for a meal and it isn’t forthcoming within what they consider a reasonable time-lag. The weather has broken. We’ve had sheets of rain that sounded so loud I wondered if it was hail. In view of this, I decided to pick the rest of our pomegranates, which will only split otherwise. I also felt the quinces again, and some of them came away from the twig with only a slight twist. Others aren’t ready yet: I would have had to break the twig to get them off manually. I ended up with quite a heavy basket since each fruit weighs on average 350 – 400g. 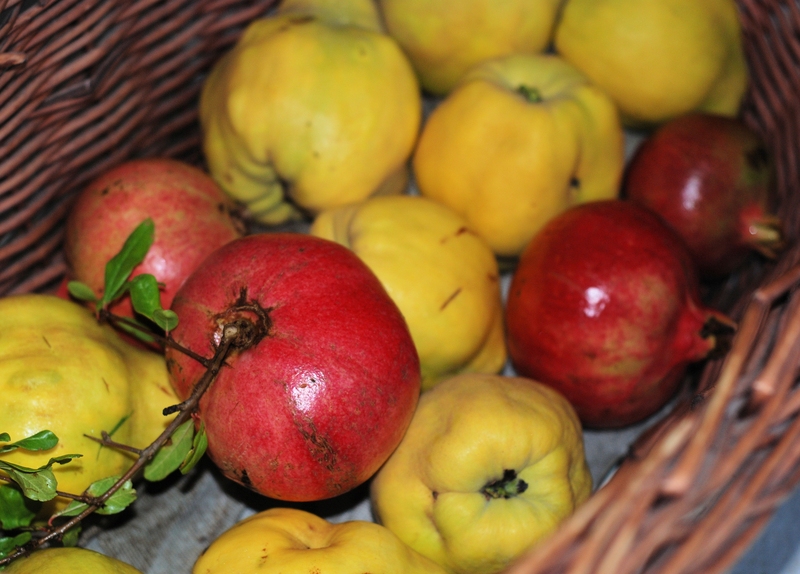 There were quinces and pomegranates for sale in the greengrocer’s today- smaller and seedier-looking than ours. I reckon the pomegranate in the basket with the leaves attached could have been a prizewinner if it hadn’t been for the very small slit in it. 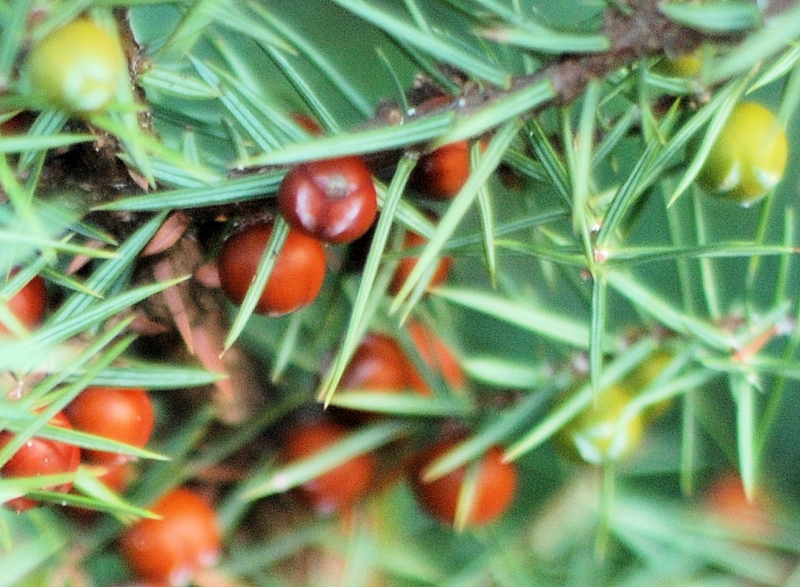 Struggling up the slope to the house with my heavy basket of apples the other day, I tried to take a short cut and landed myself in a thicket of tall juniper bushes. They’re not the most comfortable of bushes to push through. I was surprised to see that the maturer ‘berries’ (in fact miniature cones) weren’t blue as I expected but a bright rust red. I looked the phenomenon up and apparently it’s a different species – not, as I first feared, the effect of some strange disease. It’s very tricky deciding on the right moment to pick pomegranates because, unlike quinces for example which also stay on the tree well into the Autumn, they never become easy to pick. Are they ready to pick? 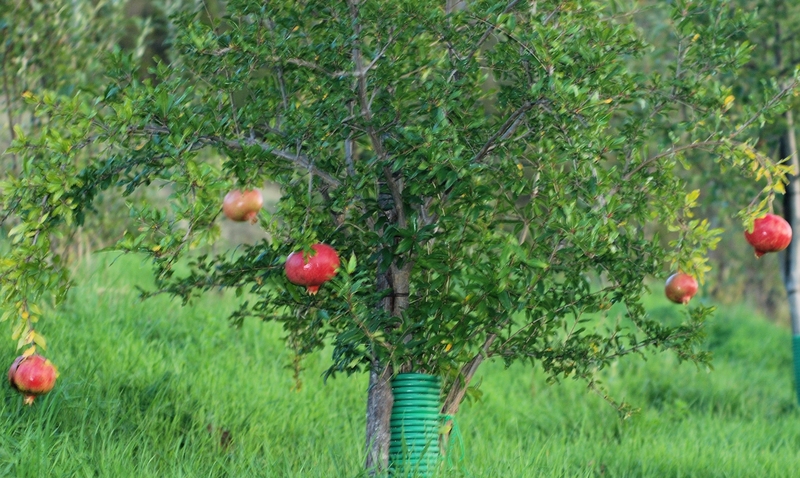 The longer they stay on the tree the better, because they’re that much sweeter and juicier, but at the same time there’s the risk of them splitting. 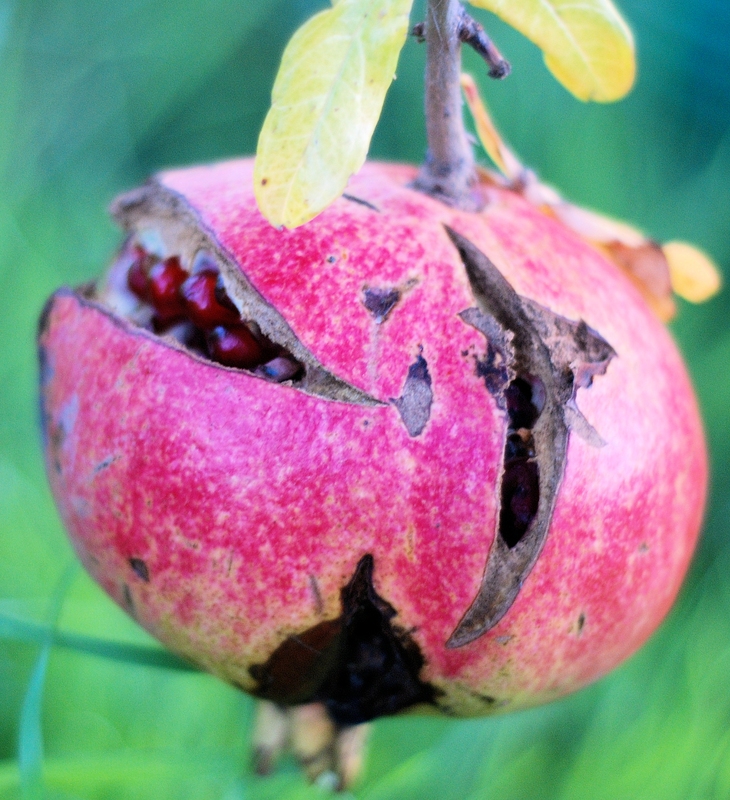 A split pomegranate isn’t necessarily inedible, provided it’s picked before the ants find it. The one that split earlier in the year, while slightly sour, proved quite tasty in the end. However this one, despite its seeds being a wonderful ruby colour and auguring well, was actually a big disappointment because most of it was rotten.